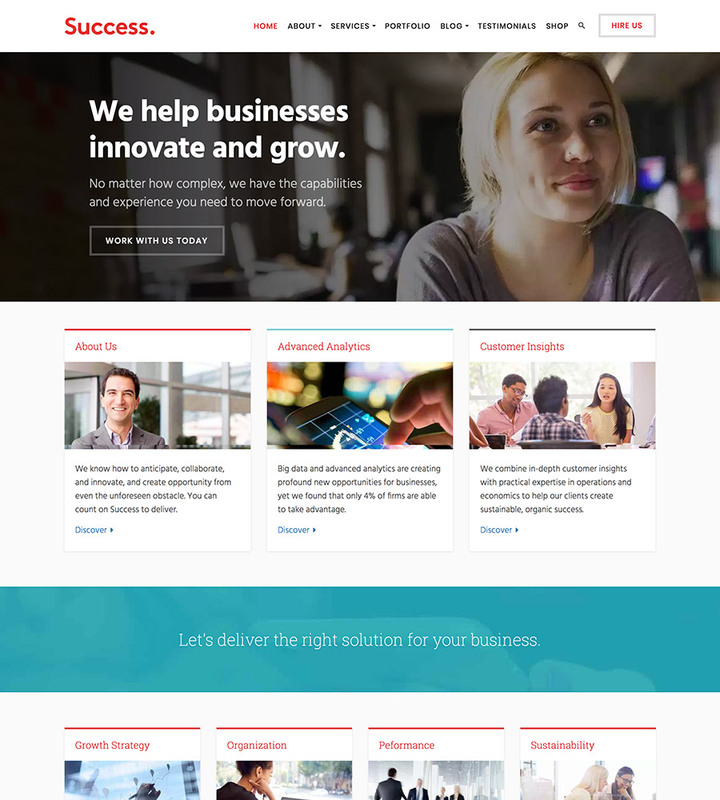 A pixel perfect WordPress theme optimized for business consulting and professional services firms. After spending many hours studying dozens of the best business and professional services websites we wanted to create a best in class theme for consulting firms around the world. Success is a bright, stylish solution which will make your company look cutting-edge. It includes a host of features and options which make customizing it a breeze. These include dozens of theme options which make branding your site incredibly quick and easy. Also, with the included Visual Composer page builder and premium LayerSlider plugins customers can shape the content just to their liking. It’s easy to quickly recreate a website similar to our demo site in minutes using our one-click installer. Don’t waste hours reading manuals to get up and running. Users can get their website built faster so that they can start selling today. The detailed inner pages within Success look fantastic. It has been designed in such a way so that large images are not required for each section. This is especially useful if a firm doesn’t have many company photographs. A solid brand color and a strong, central message can be used to put your point across. Success is fully compatible with the leading SEO plugin on the market, Yoast SEO and passes Google’s Structured Data Testing Test Tool. Plus, when you do need help we’re here for you. Customers rave about our world-class support team. Display the company news via a list or a grid structure. With a crisp, modern layout the latest updates will look bright and clean.